Okra is well known vegetable in Nigeria because of its usage in cooking the very popular "okra soup". We consume Okra more often giving little or less consideration about the health benefits it possesses or gives to us. The popularity of Okra does not stop in Nigeria alone because it cuts across Africa and the whole world at large. Japan is the world's most productive land of Okra. this is the chief reason why both the old and young all look healthy in Japan. When asked for the reason behind their good health, the Japanese will graciously answer that it is “Okra”. In this post we are going to be looking at few notable health benefits of Okra which is also know in most English-speaking countries as “ladies finger” . By cleaning the intestinal tract, Okra is capable of enhancing the colon's health by making the organ to work at a higher rate of efficiency and decreasing the risk of acquiring colon cancers. The presence of Eugenol in Okra facilitates the fight against diabetes. The fibre additionally aids in stabilizing blood sugar levels by delaying sugar absorption from the intestines. Okra is one of the pleasant vegetable resources of dietary fibre essential for the digestive system. Nutritional fibres in okra helps preven and relieve constipation. The soluble fibre in okra absorbs water and provides bulk to the stool as a result, stopping constipation. 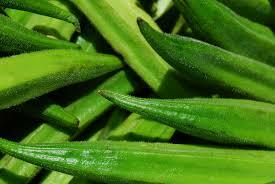 The iron content of okra forms haemoglobin pigment in the blood and stops anaemia. Vitamin K facilitates in blood coagulation. The dietary fibres contained in this vegetable supports people who are on weight loss programs. Okra has a completely low caloric value so it is far a remarkable addition when losing weight. The soluble fibre in okra helps to decrease serum cholesterol and at the same time reduces the danger of heart disease. Consuming okra is a powerful way to control the body’s cholesterol level. Okra is also high in pectin that facilitates in reducing high blood cholesterol by way of changing the manufacturing of bile within the intestines. The excessive vitamin C content in Okra helps combat cold and cough by encouraging a healthy immune system. The vitamin C and plenty of essential minerals like magnesium, calcium, manganese and iron in okra additionally fight in against dangerous free radicals and consequently promote a standard healthy immune system. Vitamin A and beta carotene found in Okra are vital vitamins for improving good eyesight. Similarly, these essential vitamins additionally help prevents eye associated diseases which include cataracts. The vitamin A promotes good eye health and protects in against age related eye problems. The high quantity of folate contained in the okra is beneficial for the foetus during the period of pregnancy. Folate is an essential nutrient which improves the development of the foetus’ brain. The high quantity of folic acid in okra plays an important position in the neural tube formation of the foetus from the 4th to the 12th week of pregnancy. These health benefits of Okra should be greatly placed into consideration, so therefore, "eat more Okra".